First ever imaging of brain cells’ reactions to concussive trauma in real-time. In the United States over 1.7 million cases of traumatic brain injury (TBI) are reported yearly, with the predictive correlation of cellular injury to impact tissue strain lacking, particularly for neuronal injury resulting from compression. Given the prevalence of compressive deformations in most blunt head trauma, this information is critically important for the development of future TBI diagnostic and therapeutic strategies. Now, a study from researchers at Brown University successfully images what happens to neurons after they experience the kinds of forces involved in a blow to the head, in real-time. The team state that their findings could help the global medical community understand how TBI unfolds at the cellular level. The opensource study is published in the journal Scientific Reports. Previous studies show that at the cellular scale, diffuse neuronal injury, including diffuse axonal injury (DAI) and neurite swelling, has emerged as one of the hallmark pathological identifiers of TBI. Morphologically, diffuse neuronal injuries and cellular degeneration are identified by membrane swelling, or blebbing, due to vesicle and organelle accumulation within the injured neuronal cell. Although the clinical importance of neuronal injury is widely recognized, a complete understanding of the exact strain, deformation mechanisms, modalities and thresholds producing the injury remains elusive. The current study develops a device that can compress neurons inside 3-D cell cultures to simulate the stress caused by TBI, while using a powerful microscope to continuously monitor changes in cell structure. 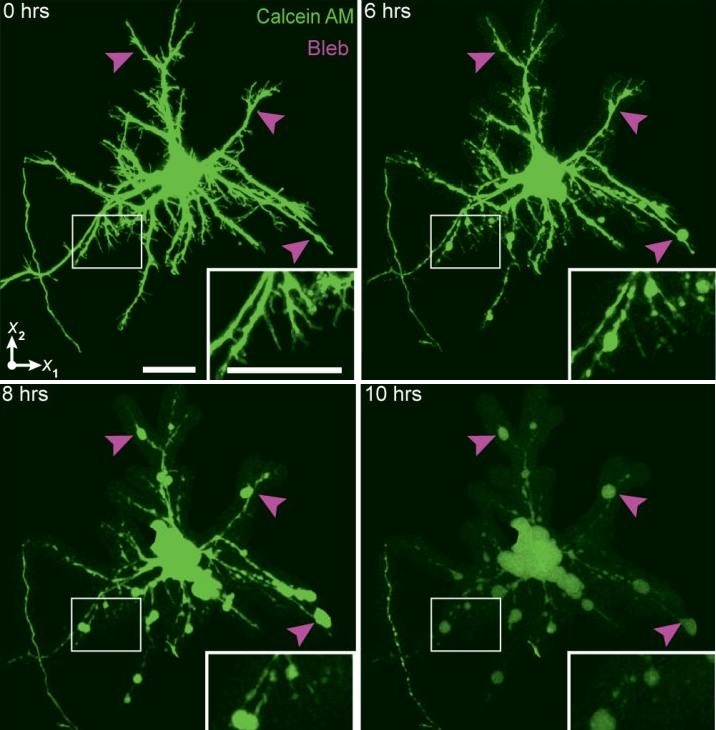 The current study grew rat neurons in 3-D collagen cultures which were placed in the custom device, which has a hydraulic piston apparatus that sits atop a laser-scanning microscope. The piston delivers precisely tuned compressive force to the culture, while the microscope generates continuous images of cell structures in real-time. Results show that after a compression event with forces similar to those involved in TBI, it takes approximately six hours for neurons to develop irreparable structural damage. The lab explain this suggests that this could be a window for therapeutic intervention aimed at minimizing further damage. Data findings also found two different types of structural damage occurring in cells following compression, namely, DAI, a well-known hallmark manifestation of cellular TBI, and a second form, which also led to cell death, and not previously associated with TBI. The group state that their findings show that the full extent of TBI damage in the brain could be underestimated in some cases. They go on to add that, to their knowledge, this is the first study that applied this kind strain to brain cells and followed them over time. The team surmise that although their novel system doesn’t have nearly the complexity of a real brain, it has provided fundamental data on how neurons respond to the previously elusive strains involved in TBI. For the future, the researchers intend to use more complex culture media in order to better simulate the differing tissue structures in the brain and plan to use their device to evaluate possible therapeutic measures. They conclude that it is hoped the results from these studies will eventually guide clinical research aimed at reducing the devastating effects of TBI.